The lay-out of this City Loft provides light and space everywhere. 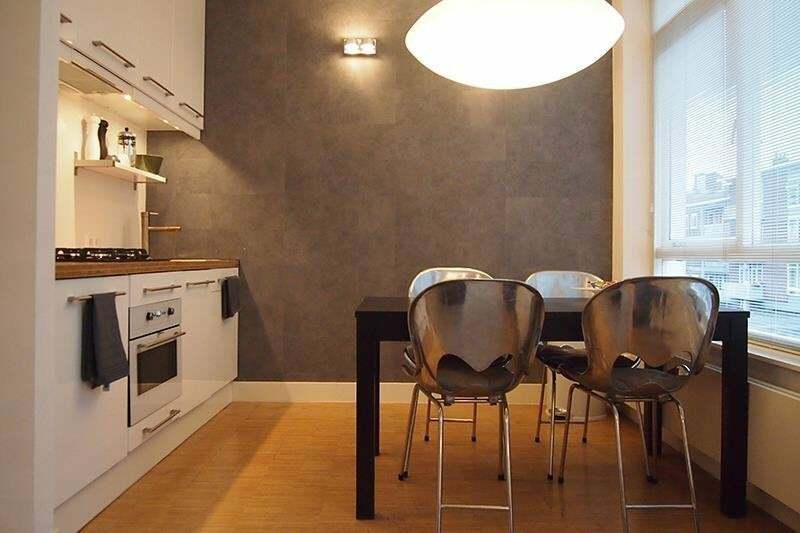 This well designed 50 m2 short term rental apartment consists of a comfortable lounge area with reading lamp, flat screen tv with extra international channels, and DVD player with some DVD’s. By the window there’s a large dining table, next to the fully equipped kitchen. A bedroom with King-size box spring bed and large wardrobe, luxurious bathroom, separate toilet, and sunny balcony next to the bathroom. Extra sound isolation has been built in during the radical renovation to create a quiet short term rental apartment for a good night sleep. Ideal for a somewhat longer stay in our studio for rent in Rotterdam, for example during a business or cultural project or a one week city visit. The used materials are remarkable and luxurious. Italian granite tiles in the bathroom, sophisticated wall paper and a beautiful bamboo wooden floor that continues in bathroom and toilet to enhance the spaciousness of the apartment. On the walls art work by Rotterdam-London based photographer Dineke Versluis. pleasant size and furnishing for someone to feel comfy on their own; double boxspring bed in one piece. Our 2 room studio for rent, is located directly above a trendy art gallery, and just a stone’s throw from the MaHo quarter, Rotterdam’s latest hot spot in the city centre. This quarter is a typical post-war Rotterdam neighborhood, whit a lot going on. You’ll find specialist boutiques, hip bars and cafes, and the latest restaurants. This neighborhood also contains the lively market, the historic St Laurenskerk and the cube houses of architect Piet Blom. The area borders some major shopping streets and the Oude Haven-area (meaning: Old Harbour) with many lively bars and restaurants. The charming residential area of Kralingen is also nearby. Several international companies at the Maasboulevard and Boompjes can be reached on foot. The nearest tram station at Burg.Van Walsumweg is 90 meters away, the nearest subway station Oostplein 250 metres, and Rotterdam Blaak Railway Station is only 450 meters. There is paid parking in the surrounding streets, and a multi-storey parking garage named Kiphof, in the Kipstraat, at only 100 meters away.